For me, over ripe bananas create an unsettling mushy feeling in my mouth that turns my stomach. So when I purchase a bunch of bananas I'm usually looking for ones that are just approaching ripe so that I can enjoy them all at a consistency I like. But when a banana becomes too ripe on my hands I do my best to find ways of using them before I have no choice but to throw 'em out: Banana milk shakes/ daiquiris (aka fig punches); banana pancakes etc. But more recently, Banana Almond Cupcakes! 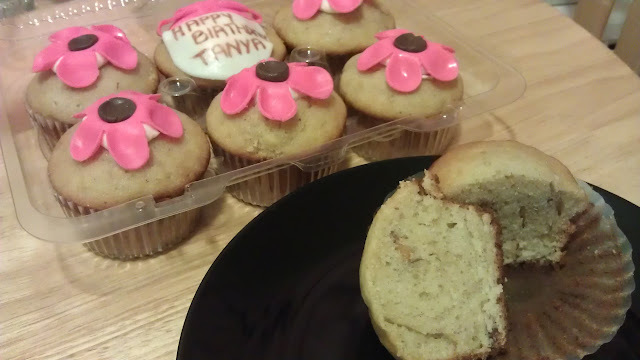 About two weeks ago I concocted my first Banana Cupcake recipe using some over ripe bananas. just in time for a friends birthday. I smashed two bananas until they almost looked liquid, added a bit of cinnamon, chopped almonds, vanilla and almond essences. Using oil as my base, after the eggs and sugar were beaten, I alternated the banana- almond mix with sifted self rising flour and baked them for about 25 minutes. The results were an incredibly moist, light (but not airy) well... Banana- Almond Cupcake! Each of the flavors were well pronounced and the almonds added a nice bite within the cake. The cakes were even awesome hot! (I ate 3 as soon as they came out of the oven) The cakes were so good bare that I only put a tad of cream cheese frosting to stick on the decorations, which also added a nice complement. And the birthday girl was very pleased.